Here are some outdoor artificial flower decorating ideas you can integrate with the existing natural landscaping around your home. It will look great and is relatively inexpensive to do. See the cluster of blue flowers in the upper left corner of this photo? They're fake, but don't they look natural and life-like? Now, I can hear you saying, "But I thought silk flowers were only for indoors. Won't they be ruined if I leave them outside?" The answer to that is, "Yes — BUT..."
Artificial flower manufacturers do NOT recommend that consumer-grade faux flowers and plants be placed outdoors. They CAN be left outside, but don't expect them to last more than a season, about 6 to 9 months depending on weather conditions. 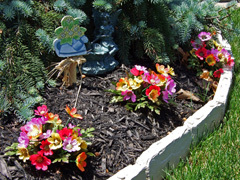 There are outdoor artificial flower, plant and tree manufacturers that do create specialty products to endure for years in a changing weather environment. But these are expensive and are not what we'll discuss in this article. 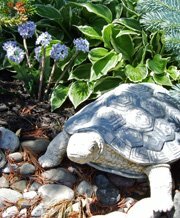 No, we're talking about dressing up the flowerbed, poolside, porch or patio with medium-grade silk plants and flowers that are readily available in craft stores or on the internet. We're going to keep our eye out for special deals, like Michael's Craft store's 50% off sales, and come home with an armload of bargains: relatively cheap artificial flower stems, foliage and plants, some large containers, and whatever else we may fancy. Don't expect your outdoor artificial flower displays to last more than a season (although you can prolong longevity by moving them indoors during bad weather whenever possible). A friend of mine decided to spruce up his home grounds with minimal effort and expense for an upcoming family gathering, so off we went to do some silk flower shopping. The best way to save money is to make your own outdoor artificial flower and plant combinations, as long as you don't mind spending a sunny afternoon putting together a few container gardens and 'planting' silk flowers around your property — just like my friend did. Sure, you could buy ready-mades if you're in a real hurry — but what fun is that? It so happened that a nearby Michael's Crafts store had a 50% off sale going on. My friend had some faux flower ideas in mind, and chose all the pieces himself, while I offered suggestions and later assisted with shaping the elements. Following are some actual examples of the outdoor artificial flower decorating he did. These silk floral bush and silk flower stem 'plantings' placed with existing live landscaping look amazing, even from a few feet away! For each, my friend used a screwdriver to dig a little hole, pushed the artificial flower stem in so the foliage would almost touch the ground, then packed the dirt around it. He did 'Instant Outdoor Artificial Flower Plantings' in minutes, in three areas. 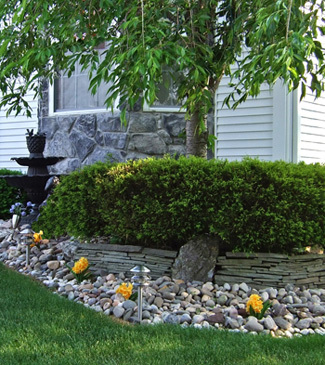 Here, several silk Daffodil floral bushes adorn a rock bed in front of the house. They're a small accent, but the splashes of yellow add some charm. And here are several colorful multi-hued silk flower bushes set along the perimeter of a shrubbery patch near the driveway. About 8 of these blue silk flower plants were scattered in the central shrubbery bed on the front lawn. 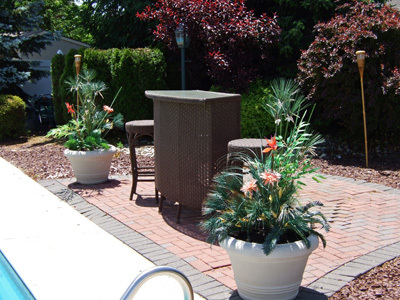 For some dramatic accents for pool and patio, my friend purchased some large plastic tubs or urns and a mix-and-match selection of silk flowers, plants and foliage. 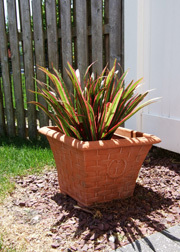 Now, it's very important to place a minimum of 6 bricks or large heavy stones in the bottom of these tubs to keep them in place, because windy days will come along and try to carry your container gardens away. So you should have bricks on the bottom, then several layers of styrofoam, and perhaps a covering of river rocks or gravel on top, after all the artificial elements are in place. 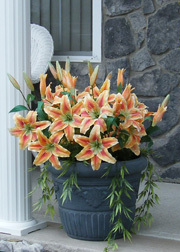 Up on the porch, we filled a container with about one dozen silk Tiger Lily stems and some hanging artificial greenery. 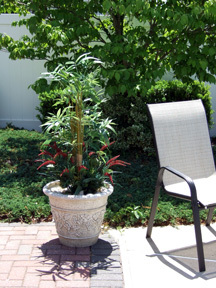 On the side of the house, a group of 3 red-green silk foliage bushes set in a decorative pot stand guard by the pool gate. 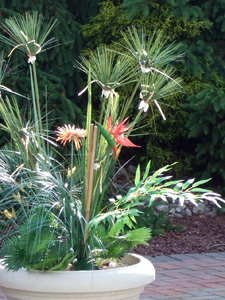 My friend wanted some large, exotic-looking container arrangements for the backyard patio and poolside. 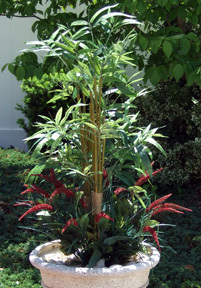 For the patio inside the pool gate, in a large stoneware-look plastic urn, we combined 2 artificial bamboo clusters with 3 grass/foliage picks spread around the base. These had unusual small-blossomed red 'tails' (could be Amaranthus or red Goldenrod). This bamboo container arrangement stands about 4 feet high. Across the pool is a second smaller patio. On either side of the tiki-style bar are the largest outdoor artificial flower and plant arrangements we made. The plaster-look plastic tubs are about 2 feet wide, and these container gardens are about 4 feet high. There's quite a medley of faux flowers and foliage in them. There are several stalks of artificial papyrus, some small fern picks, a silk Bird-of-Paradise stem, and even some 'leftovers' from the previous season (large silk Zinnia stems and assorted artificial greenery). These outdoor artificial flower, plant and foliage displays got lots of compliments from neighbors and house guests. Total expense was around $350, and everything was done — including the shopping — within one morning and afternoon. 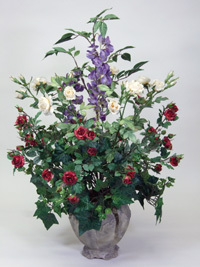 Here's a medium-sized artificial rose and ivy bush arrangement for the patio, which you can make yourself from instructions in The Silk Flower Centerpiece Handbook: A Course FOR IMPATIENT PEOPLE. You could also decorate a garden arch or wall trellis with artificial garland, vines and silk flowers. During holiday season, my friend twines evergreen garland and strings of lights on an arch similar to the one shown. Sections are secured in place with 'twist-ties' or paddle wire. Go ahead, try these outdoor artificial flower ideas yourself. For a small investment of time and money, you can really get some great results. 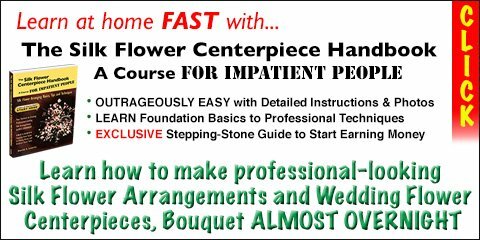 More FREE Silk Floral Craft Coaching!